Everything went quite well and the trainer helped us throughout the training. I joined the course with the goal of learning the NodeJS basics clearly. After the completion of the course, I can say that the course delivered what was offered. I want them to increase the hours of the sessions so that we can learn a lot. For me the learning experience was pretty amazing. The course has covered almost all the concepts including events, stream, and modules. I must say the trainer was well versed with the advanced topics of NodeJS. I enjoyed a lot coding under the guidance of our trainer, James. Zeolearn's training in Ottawa has given me enough exposure in the field of NodeJS. I attended the course with the mindset of learning the basics and applying the concepts in the real world problems. The mentor helped a lot in learning the advanced concepts of Node such as events, stream, modules. Zeolearn should conduct more of such training sessions. I must appreciate the kind of effort the trainer has put throughout the training session. The coding sessions we had was very unique because the trainer constantly explained the codes. Not to forget, the excellent post training support I received from the trainer. This helped in completing several node based projects. The concepts I learnt during the NodeJS course helped me a lot while working on web applications. Even after the course completion, I had the access to the reference materials and trainer was available all the time in case of any doubts. The trainer reviewed my project then and there. I have already worked on NodeJS long back. I joined this virtual training to freshen up the concepts and syntax. Since I already know the concepts, it was not much difficult for me to grasp the concepts. Initially I had some difficulties while working on the course based project but later I completed it successfully because the trainer helped a lot. Is Node JS a Programming language? Is Node JS Open Source ? What exactly is Node JS used for? What are the main features of Node JS? Asynchronous and event Driven – All APIs of Node.js library are asynchronous, that is, non-blocking. It essentially means a Node.js based server never waits for an API to return data. The server moves to the next API after calling it and a notification mechanism of Events of Node.js helps the server to get a response from the previous API call. What are the various databases that are suitable for Node JS? The usage of databases depends on the purpose, speed, and ease of use. You simply can’t choose a database based on the language and framework. You choose a database based on the data and scale, platform requirements, and how the features of the database match your requirements. If you want a database that has a lot of community and great documentation work, you can use the databases coming under SQL categories like MYSQL, PostgreSQL, SQLite or MongoDB. Redis is an in-memory database. MongoDB integrates well with Node.js, and it provides a great wrapper package called ‘Mongoose’. Before choosing any database, make sure you select according to the features they provide and your needs. Why has Node JS become very popular? More importantly companies like Netflix, Walmart, PayPal, LinkedIn, Uber, NYT, eBay and many more are very productive building applications with Node js. Which are the major companies using Node JS currently? Node.js is increasingly becoming a part of the multiple corporate giants across the globe. The developers love features like open-source, concurrency, speed, versatility, agility, and fast performance. Today, many companies are using Node js to develop several applications such as social media apps, real-time tracking apps, video and text chat engines, online games, and collaboration tools. Along with these, there are several other global majors like Microsoft, Google, Yahoo, Mozilla, and Github who have embraced Node.js as a part of their operations. More and more companies are using Node.js due to its innumerable advantages. How do I install Node JS? Nodejs can be installed by downloading the respective binary from nodejs website. Along with nodejs npm also will be installed. How do I check Node JS version? This command should give you some output like v10.13.0 if node is properly installed and configured else you would receive an error stating node is not recognised as internal or external command. What are the various Node JS Frameworks? Which is the best Node JS Framework? The best Node JS framework is expressjs, in fact it is a foundation for many nodejs web implementations. Express JS, is a web application framework for Node.js, and is designed for building web applications and APIs. How do I learn Node JS? What are the various resources to Master Node JS? What is the roadmap to become an expert in Node JS? Learn how to gauge feature quality, implement unit testing, and ensure sufficient code coverage in your Node.js apps. What techniques, knowledge, and skills do I need to become a node js developer? Exposure to protocols like http, tcp etc. Which are the best training institutes for Node JS? Among these Node js training providers, Zeolearn has gained more traction from the industry experts due to the course features they are offering. You can clear your skeptics anytime through one-to-one discussion with the trainers. The up-to-date course which is designed by our team of experts provides reason-based training that helps to gain not just theoretical but also practical knowledge that makes the learning more simplified. You can share your opinion and improve your coding skills with the help of the instructors through several collaborative medium offered by us. What are some good certifications or online courses for Node.js? What is the best Node.js course online? Node.Js training should be taken from the best online courses available. The idea behind any Node.js course is to help the learners build fast, concurrent, lightweight, efficient data-intensive real-time applications that run across the distributed systems. The best way to learn Node.js course is by developing real-world Node.js applications. There are several free online resources available to learn Node.js. But the best way to learn a programming language is through an experienced trainer/mentor. If you are aware of the core concepts of Node.js then taking Node.js training from the reputed institutes will turn you from zero to pro. Our team of web development experts have compiled the following list of best Node JS training providers based on in-depth research. Among these Nodejs training providers, Zeolearn has become the top choice of the developers with years of experience. The course at Zeolearn is live, interactive and provides reason-based training to acquire theoretical as well as practical knowledge. The curriculum, designed by the experts, covers every concept of Node js and aids you to advance your learning through a step-by-step guidance on tools and techniques. In case of post-training queries, you will get access to lifetime mentoring to clear your doubts on Node js. How do I get certified as a Node JS developer? Is there any authorized Node JS Certified Developer program? What is the average salary of a Node.js programmer? According to the ZipRecruiter salary report, the average salary for Node.js programmer in the United States is $115,762 a year. According to the recent job postings on ZipRecruiter salary website, the Node Js Developer job market is very active today. As stated in Forbes report, the number of jobs for Node.js developers alone has increased by around 25%. Please note that the data presented by these 3 salary websites is the collection of millions of active jobs published locally throughout America to estimate the most accurate annual salary range for Node Js Developer jobs. What is the demand-supply gap in the market for Node JS developers? The demand for Node.js is growing exponentially. According to NodeSource, the total number of Node.js downloads increased by 49% from the last year. The use of Node.js platform in software development has increased more rapidly from its release in 2010. 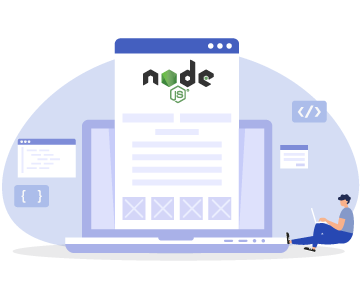 With early adopters such as LinkedIn, Paypal, and other tech companies, Node.js has seen the rapid increment in its utilization in web development. The U.S. Bureau of Labor Statistics posited that. by 2020, there will be 1.4 million computer-science related jobs available with only 400,000 computer science graduates to fill these roles. You can stand out with the Node certification to become visible to the potential employers. How will be the future prospects for Node JS Developers? What roles are offered by companies for Node JS professionals? This is the list of various roles offered by the companies to the Node JS professionals.